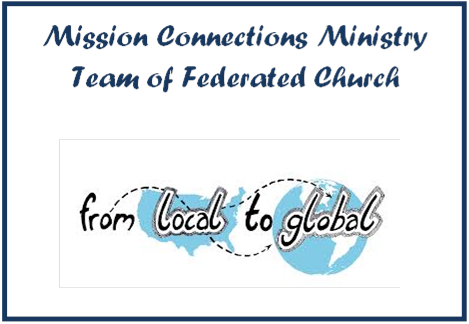 The Mission Connections Ministry Team has this focus: To communicate, raise awareness, and invite the people at Federated Church to connect with Christ's community locally and throughout the world. We serve as the umbrella for all the social justice and mission efforts of the church. Our A-Z Guide to Connections lists 38 local and global projects that are sponsored or supported by the Mission Connections Ministry Team. Above and beyond our planned giving, we sponsor four seasonal offerings each year - One Great Hour of Sharing, Pentecost, Peacemaking, and Christmas Joy. In addition, we host such events as Alternative Christmas, and donate to such groups as HELP and Church World Services. "The DNA of Federated Church includes an active participation in community service and international mission," states Pastor Andrew Headden. Historically, Federated Church has been the advocate and initiator of many local not-for-profit organizations to provide services for people who are in need and are not being served, as well as a mission partner to ministries throughout the world. We invite you to join in this vital part of the Federated Congregation! Mission Connections Ministry Team generally meets the 2nd Tuesday of each month from 5:00 - 6:00 pm in the Health Ministry Room. ​Questions? Please email Wendy West. View the A-Z Guide to Mission Connections to learn more.